here if I realized how bad the rain was going to be during the night! By morning, the rain had stopped and the skies had cleared to a large degree. That freak rain storm overnight, I hoped, was just an anomaly, but I definitely wanted to get a fresher weather forecast when I passed by Sunrise later in the day. That was top on my to-do list for Sunrise! By the time I got up, the father and son who had filled the shelter with their tarp had already left. I was a little surprised when I realized this. I had heard them moving around in the morning, but it's not like I slept in especially late, but they were already packed and gone when I got up at 7:00. Since the shelter was now empty, I threw off the tarp and started moving my own gear into the shelter. It was dry there--certainly nothing else outside of the shelter was dry! But then the father and son managed to piss me off a second time because they left a bunch of dried mud all over the place. There was a broom inside with a note asking that people sweep out the shelter to help keep it clean, but they obviously must have felt that sweeping was woman's work because they left the shelter a mess. I called them a few not-so-nice names. Well, okay, I was mostly mad at the father. I didn't feel like the young kid was to blame, but the father was certainly teaching his kid a lot of bad, inconsiderate habits. I ate breakfast, packed up and watched the sun rise. I packed my gear as if it would rain, waterproofing anything I didn't want to get wet. I hoped it wouldn't rain, but I wasn't going to take the chance. 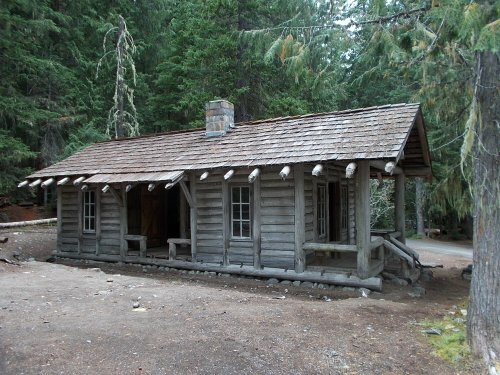 After all was done, I picked up the broom and swept out the shelter which mostly consisted of the dirt that the father and son had trekked in. 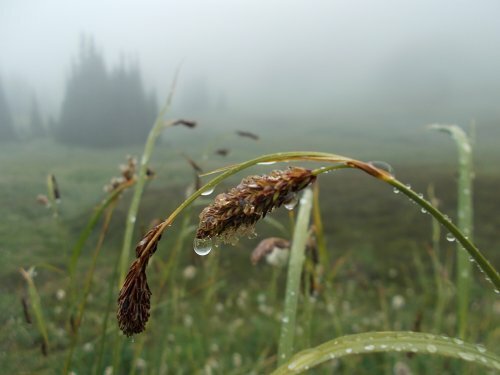 I wasn't on the trail for very long when I felt the first drops of rain. Ugh. I hoped and prayed it was just a few random drops, the last of the rain being squeezed out from the last of the clouds, but ugly clouds seemed to be rolling in as reinforcements. Things weren't looking good. Still, I crossed my fingers and hoped for the best. The trail descended steeply towards the White River then went almost entirely flat for a couple of miles as it paralleled the White River to the White River campground. Those two or three miles were probably the flattest section of the entire trail! 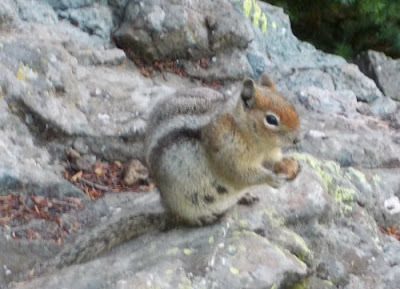 The resident ground squirrel hanging out by the shelter. That was also where I saw one of the most incredible sights of the trail: A woman carrying a baby on her chest and a large backpack on her back. She was backpacking with a baby?! I stopped to talk. I had to talk to her. I'd never seen anyone backpacking with a baby before. That was amazing and totally awesome, though! So many people seem to have babies then say they can't do all these things. "I have a baby, you see. I can't do this, and I can't do that." 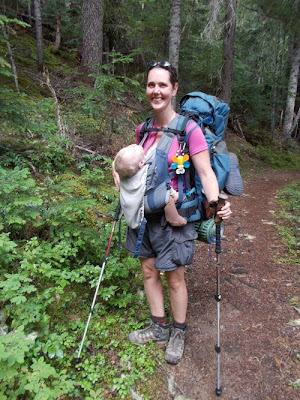 I've heard people who said they can't take short day hikes "because of the baby," but this woman is backpacking with a baby?! Good for her! Joanne (the mom) introduced me to Julia (her baby). Julia seemed dead asleep--perhaps the rocking motion of her mom walking down the trail put her to sleep. Her head hung back limply and she didn't even open her eyes, and my chatting with her mom didn't seem to disturb the baby in the least. "So where did you start?" I asked, figuring that they would only be out for a couple of nights at most. After all, she had a baby with her, after all! They started at Box Canyon about a week earlier, though, and were thru-hiking the entire Wonderland Trail. They'd be done in just another day or two. left me optimistic that the weather would be nice today. "Were you ever a thru-hiker?" I asked. She must have been a hard-core backpacker to even consider backpacking the Wonderland Trail with a baby, so it seemed logical that she might have thru-hiked some other long-distance trail. "That is just so awesome," I told her, meaning it. I looked down at Julia again, sleeping contentedly. "She's going to grow up to be a thru-hiker," I told her mom. Wow. That was just so cool. Her husband caught up with them at this point and we shuffled on in our respective directions. I'm so glad I crossed paths with the thru-hiking baby. I must have passed them somewhere on the other side of the mountain earlier in the week, but I would have remembered seeing a baby on the trail and I definitely didn't see any of those! They must have already been in camp somewhere as I walked by completely oblivious to these remarkable hikers. Or maybe I was off hiking a side trail somewhere when they passed me by. Who knows? But I'm glad I at least crossed paths with them on this side of the mountain. 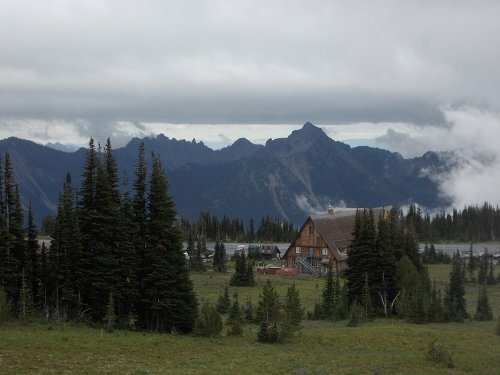 I soon arrived at the White River Camp, which officially completely my first circuit around Mount Rainier. Although I had started my hike at Sunrise, I also hiked down to White River then back up along the Glacier Basin and Burroughs Trail, so at the White River patrol cabin, my footsteps finally connected with my steps from the week before. 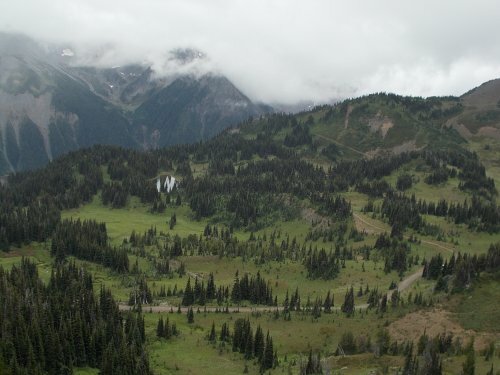 I had completed my second thru-hike of the Wonderland Trail. 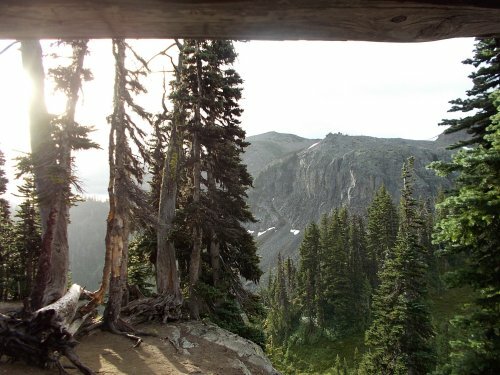 I stopped at the patrol cabin where I ate some snacks out of my pack, then I followed the Wonderland Trail up the steep climb to Sunrise. I started growing a little anxious at this point--I needed to find my food cache that I hid the week before. If that was missing, my hike might come to a screeching end at Sunrise. The weather continued to grow worse. The clouds thickened and the light rain became more steady. It wasn't a pleasant day, all things considered. I reached the waterfall that I used as a landmark, then scrambled up a steep hillside to where I left my food cache, fingers crossed that it was still where I left it. 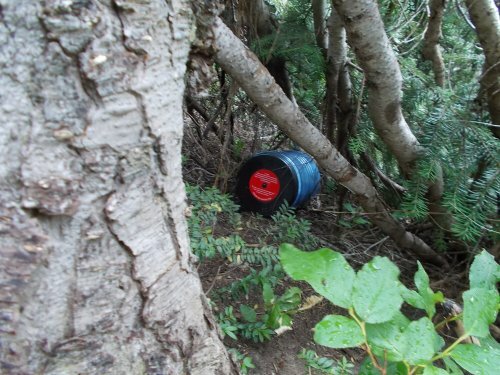 But the bear canister was far out of my reach. I poked my trekking pole under the tree at the canister, trying to push it further under the branches and through the other side of the tree. Then I tromped around the tree, moved the branches aside, and picked up my food cache. Looking through the translucent container, I could see that everything inside was completely dry. Perfect! 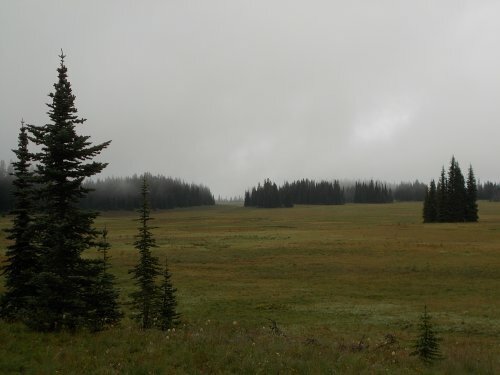 I had resupplied myself, and I was ready to trek on to Mowich Lake! As I approached Sunrise, I started seeing more tourists walking around on the trails, and I'd warn them back. "Go back! Go back while you're still dry! It's not worth it!" When I arrived at Sunrise, my first stop was at the visitor center for an updated weather forecast. I figured if the weather was expected to grow continually worse through the day and the light rain was going to turn into a heavy one, I shouldn't stop at Sunrise at all. Push on and get into camp before the weather turned really bad. But if the weather was expected to clear up later in the afternoon.... I mentally calculated that I could sit around Sunrise for about three hours and still be able to make it to camp before dark. And the forecast was.... not very helpful. For the day, it predicted an 80% chance of rain, which I laughed off. "Yeah," I said to the ranger, "more like 100% at this point." It didn't say anything about whether the weather might improve or get worse later throughout the afternoon, and I asked the ranger if she had any guesses. She didn't seem comfortable making such a guess, but did note that the chance of rain overnight decreased to 50%, so presumably, it would get better at some point. Not necessarily in the afternoon, but perhaps overnight things would improve. Tomorrow, the chance of rain would stay steady at 50%, then decrease to 30% tomorrow night and another 30% the day I hiked out from Mowich. Not exactly a stellar forecast, but at least things were looking up. Today would likely be the worst of the weather. When I called my mom, though, she seemed unexpectedly worried about me. "Yeah, I'm fine. 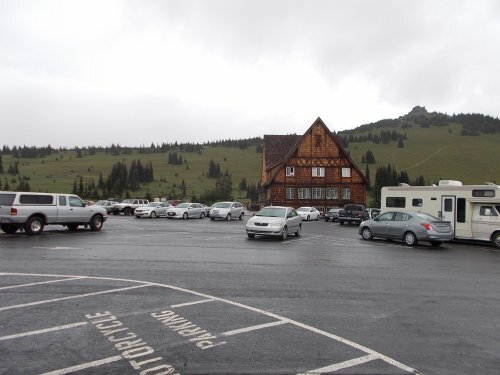 Just updating you with my progress around Mount Rainier. 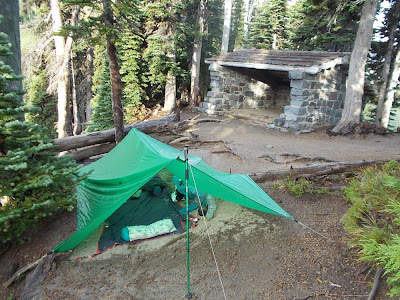 I made it to Sunrise, and I should be getting off at Mowich Lake in a couple of more days." Which is when she told me that the caller ID that came up for her said "US government" and, she was certain, that was a bad sign! Nobody wants the US government to call them direct! 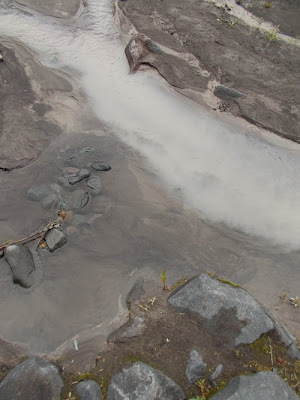 cloudy glacial flour from the White River. "Well, technically, I suppose that would be accurate," I told her. I was in a national park, after all, which is run by the National Park Service, which is a federal agency. I guess the phone is registered as being owned by the US government--and it is. I had no idea that the caller ID would show as the US government, though. That could be a useful little fact if I ever wanted to prank someone..... =) It's such a generic term.... I could pretend I was from the IRS, or the FBI, or the Secret Service, the military, or.... basically any federal agency! The term "US government" just sounds sinister too, doesn't it? The words "NPS" doesn't strike fear into the hearts of militants everywhere, but the word "US government" can! Inside, I dropped my pack and decided to try ordering a burger. At this point, I had three different groups of backpackers tell me they were delicious, and since I had three hours to kill in the hopes the weather would improve, I may as well give it a second chance. 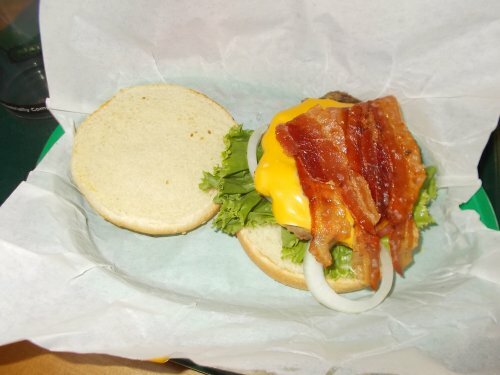 I ordered the bacon cheeseburger with all the toppings and a soda. It came with potato chips, which I didn't really want, but since they were included I took them anyhow. And the food was.... decent. I've had much better burgers, but I've also had a heck of a lot worse too. It was okay. Given that I'd now been on the trail for a week, I'd even say it was genuinely good--except I knew darned well that my week on the trail would have been coloring my point of view. Off the trail, I would have called the burger merely okay. And I killed a couple of hours reading my Kindle, writing in my journal, and catching up with postcards in the comfort of a real chair at a real table, all of which was located indoors and out of the miserable weather. A little after two hours, the weather hadn't improved. It hadn't gotten worse either, but it hadn't improved and I was starting to grow bored just sitting there reading. It was time for me to get moving again. I could have killed another half hour or hour, but it seemed pointless to wait around for weather that didn't look like it had any intention of improving. 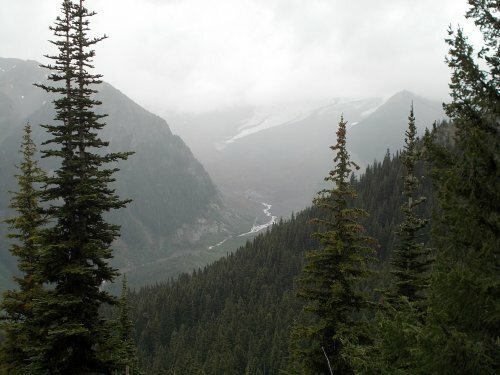 of hiking completely around Mount Rainier. 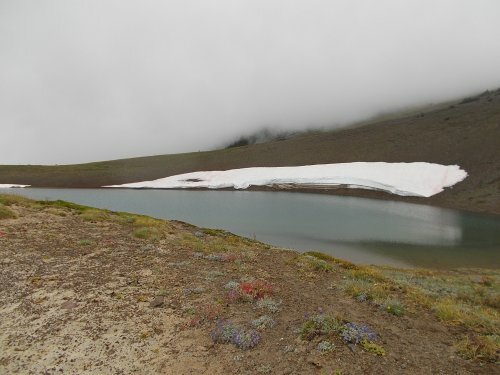 I left Sunrise to the north and followed the Sourdough Ridge Trail towards Frozen Lake. It would help limit my walking the same route I did the walk earlier. I wanted to try to use different trails than those I used a week earlier. I couldn't avoid all of the trails I had used earlier, but the Sourdough Ridge Trail knocked off about 0.6 miles between Sunrise Camp and Frozen Lake that I otherwise would have repeated. Once I passed Frozen Lake, the weather took an ugly turn for the worst. It seemed like I walked into an entirely different weather system immediately upon crossing the pass by Frozen Lake. It was foggy on the east side--that wet, soggy kind of fog--but a moderately heavy rain on the west side was far more unpleasant. For 0.7 miles after Frozen Lake, I retraced my steps from the week before until I reached the trail junction with the Northern Loop Trail and veered onto it leaving the Wonderland Trail behind once again. The trailed filled with pools of water in many of the flat areas, and since I had left Sunrise earlier than I needed to, I started using my trekking pole to dig drainage ditches for those areas. There's something immensely satisfying watching a large pool of water on the trail drain out to nothing. =) I was getting soaked doing this work, but I was already soaked at this point so it didn't matter. 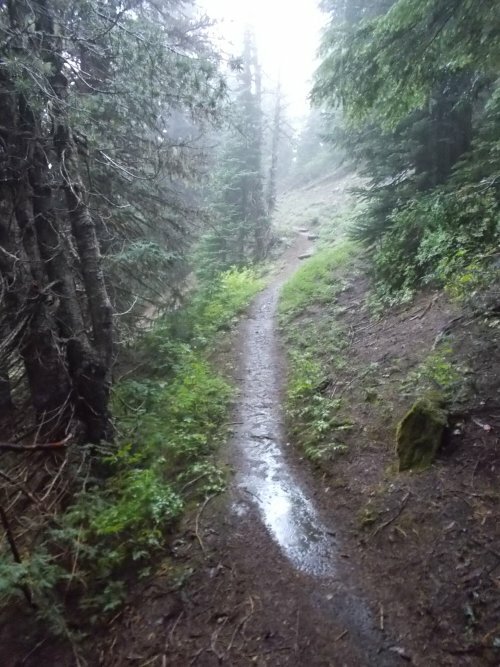 The trail passed by the edge of Grand Park, which looked absolutely gorgeous, even through the rain, and I found myself wanting to explore that area more. 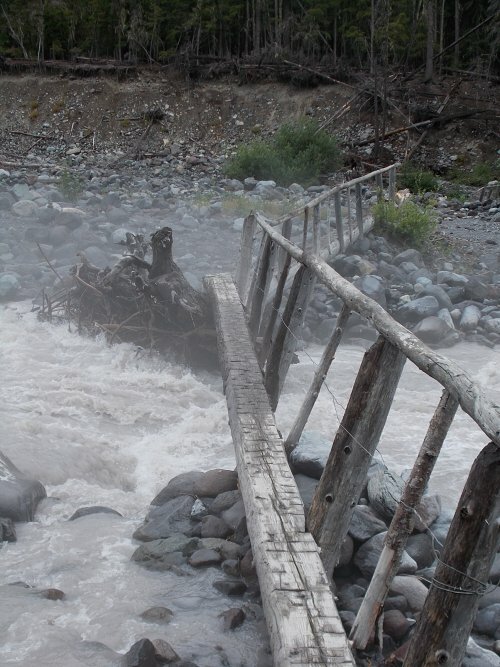 I didn't, though--I pushed onward to the Fire Creek Camp. I was astonished and upset when I reached a trail junction and the sign warned that Fire Creek Camp was 0.4 miles off the main trail! My topo map did not indicate this at all. It looked like it was right off to the side of the main trail, and I was more than a little annoyed that I'd have to walk almost half a mile off the trail just to get to camp! Stupid map-makers. How did this miss this?! My food cache, safe and sound right where I left it. and was all but impossible for me to reach from this side. But no, I wouldn't be alone. There was a large group in the group site, and another five or so people at one of the three individual campsites. I picked my own individual campsite and the first thing I did was set up my tarp. The rain had mostly stopped by now, but the trees were still dripping wet and the rain could certainly start up again at any time. I cooked up dinner, then crawled into my sleeping bag with my Kindle before finally fading off to sleep. 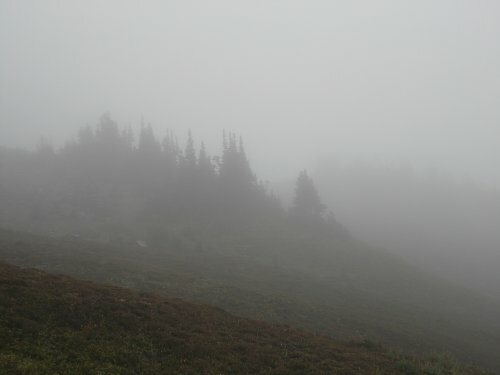 Emmons Glacier is all but impossible to see through all the fog, mist and rain. I took an photo from the identical spot a week before, though, which looked great! 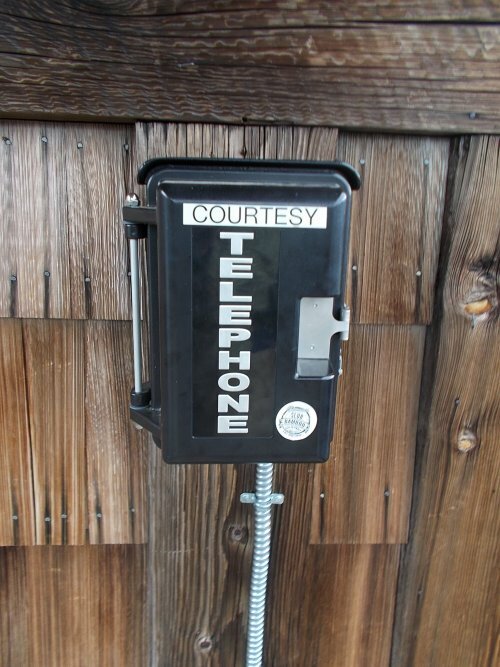 You'll need a calling card to use this phone--no quarters allowed! But if you do use it to call someone, their caller ID will read "US Government." I was not at all prepared to do run some pranks, though! the burger would likely have been "adequate." water elsewhere the first chance I got. that surrounded it had melted in the intervening week. harder, the fog got thicker, and the views got worse. Even the plants couldn't stand up straight from all the rain weighing them down! using my trekking pole to dig drainage ditches for some of them. I didn't do anything about this particular pool because it was so small. trails around this area in more depth... maybe another day! 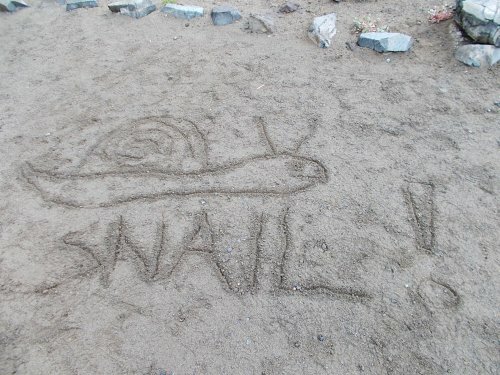 The snail was obviously drawn by someone from walking4fun who walks sloooly...like me! Your "Sunrise at the Summerland Shelter" photo looks like it could have been a still for the Lord of the Rings movies. So cool! Dad and son probably wanted to get out of Dodge before you were up.